Argan oil, also referred to as Moroccan Oil, over the past few years has made quite an appearance in the beauty market. Not that it is a new sensation, just somewhat new to us. For centuries Moroccans have used it as a topical oil to treat certain external problems, such as: dry skin, acne, psoriasis, eczema, wrinkles, joint pain, and skin inflammation. As for hair treatments it was also used to help with hair loss and dry hair. Argan oil contains vitamin E as well as other antioxidants, which is why it is such a great component in hair care products! It can help to restore elasticity, rebuild strength, repair chemical and UV damage. You really can't go wrong with any products containing argan oil. I was first introduced to products containing argan oil when I told my hairdresser I wanted Kardashian hair without having to get extensions. 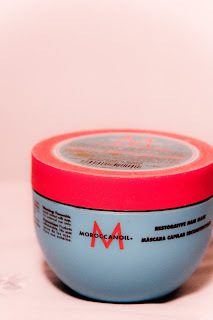 So he told me I needed to get the MoroccanOil Restorative Hair Mask (8.5 oz. $41.00 www.beautycollection.com). So I made a decision to stop dying my hair when I needed a change and decided to really put some leg work into my hair care. So I bought the mask and started doing a 30 min. regimen once a week. I would shower and shampoo my hair and then put the mask in my hair wrap it in plastic wrap and then hop in my robe and clean my room or do homework. After 30 mins passed I jumped back into the shower and rinsed it out. After doing this for a month my hair was so much better! Now I do not do it as religiously as I used to, but when my hair feels a bit dry I do the intense treatment; otherwise I just do a quick 10 min leave in and then rinse while in the shower (which may be a better option for those with less time on their hands). This product is amazing because it doesn't just moisturize my hair and make it silky smooth it also makes my hair feel thicker. Another great product is the Moroccan Argan Oil line from Organix. Organix also has many other products for other hair care needs which are fabulous as well. I like to use the shampoo and conditioner combo from the line. Since I am trying to grow my hair out to my waist I sometimes go a bit too long between getting a trim. This combo keeps my hair from being such a total wreck when I finally do make an appointment. My mom uses the Penetrating Oil from the collection once in a while, which makes her hair super silky and shiny without leaving it greasy. You can find Organix products at drugstores and grocery stores such as: Walgreens, CVS, Duane Reade, Harris Teeter, Target, and Ulta among others. You can see the other locations at www.beautypureandsimple.com. I hope you will try these products and love them as much as I do! I totally agree! Thank you for the link to more information! 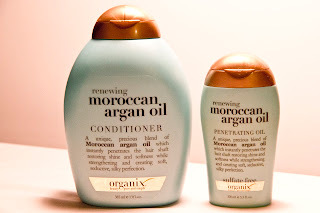 Moroccan Oil products are a luxury in-salon only professional brand for professionals only to recommend. This makes sure that the brand identity is kept strong and true and the products are advised upon and used in the correct way. As stated by Breanne earlier the products you buy elsewhere are either counterfeit or grey market and I'm not sure how an untrained eye would tell the difference. Read about the best bottle brush cleaning sets reviews. Thanks! The article talks about hair loss issues related to men and female. It specially talks about hair loss issues related to Dht shampoo and how organic shampoo are helpful to improve one's situation. wow wonderful i like your blog Send gift to Pakistan .